In today’s blog I thought I’d show you a few of the items in that you can use together in Shadowhand for special added benefits. There are literally millions of combinations of weapon, outfit and power up choices in Shadowhand and so it pays to choose a setup that maximises your effectiveness and works in harmony with your chosen strategy. Stealth is a stat relating to whether you get to start first in a duel. There are numerous clothing items you can collect or buy throughout the game that add together until eventually your chances of “calling the shots” at the opening of a bout are extremely high. The stealth stat is displayed in a black mask at the top left of the inventory screen, and is also shown on your character’s card in duels. 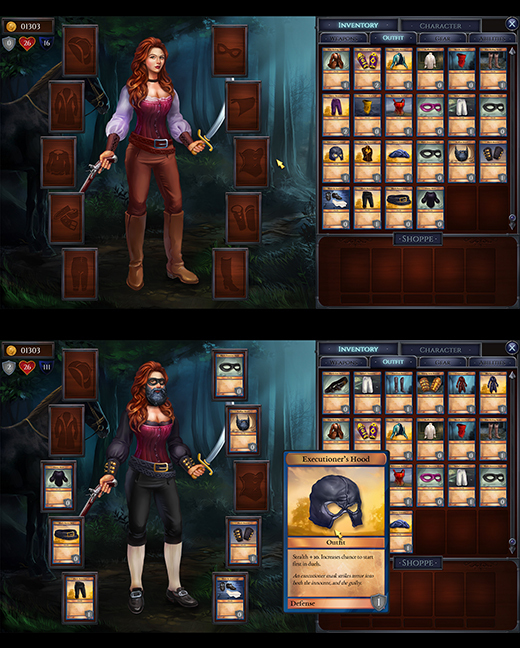 For comparison, here is a screenshot of Shadowhand wearing most of the available stealth gear, compared with one without. Her stealth stat has jumped from 16 to 111. (Note the executioner’s mask is highlighted too – this is interchangeable with the black domino mask that Shadowhand is wearing). There are plenty of other combinations of outfits and other items (such as weapons) that can be combined for a deadlier effect, look our for future blog posts on this! This entry was posted on Thursday, June 15th, 2017 at 9:59 am and is filed under Developer Diary, Game Development. You can follow any responses to this entry through the RSS 2.0 feed. Both comments and pings are currently closed.